The White-breasted Cormorant, a member of the cormorant family Phalacrocoracidae, is usually treated as a subspecies of Great Cormorant, in which case it is referred to as Phalacrocorax carbo lucidus. However some authorities (e.g. 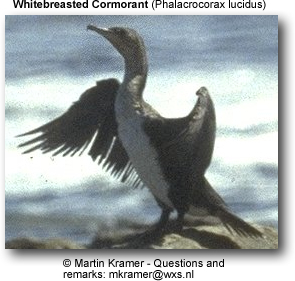 Sibley and Monroe, 1990, Sinclair, Hockey and Tarboton, 2002) retain its original treatment as an allospecies in the P. carbo superspecific group, in which case it is referred to as Phalacrocorax lucidus. A black-necked form originally classified as Phalacrocorax patricki or Phalacrocorax carbo patricki is now regarded as synonymous with this taxon. 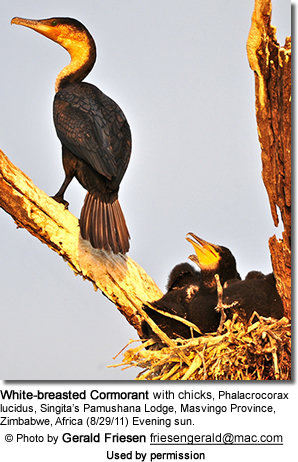 The White-breasted Cormorant is the only form of Great Cormorant found in sub-Saharan Africa. It has a wide distribution; on the west coast from the Cape Verde Islands to Guinea-Bissau and from Angola to the Cape of Good Hope and northwards on the east coast to Mozambique. There are also inland populations in Nigeria and around Lake Chad, and in east and southern Africa from Sudan southwards. 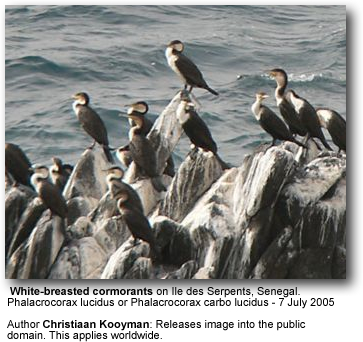 It can be found around the Red Sea, where it is sometimes referred to as the Red Sea White-Breasted Cormorant. As its name suggests, the 80-100 cm long White-breasted Cormorant has a white neck and breast when adult. In other respects it is a large cormorant generally resembling the Great Cormorant. The Black-faced Cormorant, Phalacrocorax fuscescens, is also sometimes known as the White-breasted Cormorant.